For computer modeling purposes, I am looking for some referenced quantitative measurements of the effect(s) of temperature on biochemical reactions. My question might be too broad in the sense that there might have too much variance in how different proteins respond to temperature in order to draw in general tendency. If this is so, someone willing to answer may reduce the question to transcription factor, to General Transcription Factor (GTF) or even to TFIIA. I am NOT looking for.. I am not looking for a theoretical explanation of how temperature influences this process (I have basic understanding of the importance of the activation energy as displayed on a Maxwell-Boltzman distribution and of the Michaelis-Menten equation). I am looking for a function that I can plug in my algorithms to incorporate the influence of various temperatures on the process I want to simulate. I want to simulate the average gene network from an average standard eukaryote. For other purpose, I chose parameter values coming from the yeast. A index such as the Q10 would be very useful as well. You should see this paper. They have studied the dependence of growth rate on temperature. This was measured for different organisms (all poikilotherms). As you can see, the curve is skewed. The left side of the curve from Topt follows the activation energy model (Arrhenius/Boltzmann). The right side, though they say in the figure legend also fits the model, it seems to me that the phenomenon is somewhat different. The steepness of the curve is perhaps because of denaturation of enzyme active site and therefore a loss of activity. For different enzymes the denaturation kinetics would vary. I happened to stumble into the author of this paper and that is how I got to know of this work. He seemed to agree that the right half steepness might be because of enzyme denaturation. 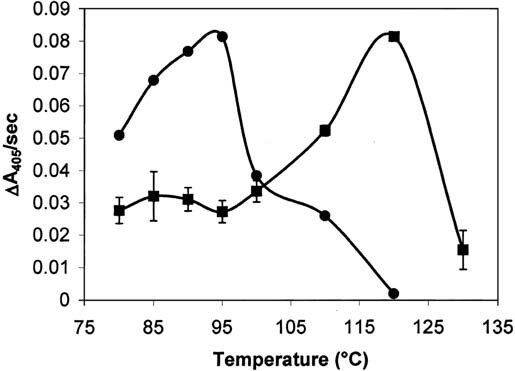 Also have a look at this article which is about the temperature dependence of the activity of the proteasome of a thermophile (same principles apply for mesophiles). Normalized Cbz-Ala-Ala-Leu-pNA hydrolysis activity of (filled squares) purified native and (filled circles) 70°C heat-purified recombinant (α + β) Mj proteasome. To normalize recombinant activity to native activity a multiplier of 1.92 was used. Error bars for the native sample represent one standard deviation for triplicate assays. Measured temperature errors were ±2°C. You can assume that the enzymes are at their optimum. 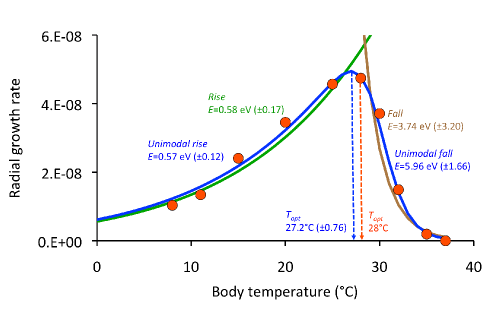 You can model the loss of activity due to increased temperature (protein denaturation) as gamma/chi square or exponential function (or the fitted function on the denaturation kinetics) and the effect of low temperature using the chemical thermodynamic equations. But the point is that we don't know if they are at their optimum or not or how each of they may perform at different temperatures. Not the answer you're looking for? Browse other questions tagged biochemistry molecular-biology proteins mathematical-models or ask your own question. What are the effects of enzyme exposure to high temperatures? What is the effect of persistent hypothermia on cardiac performance?